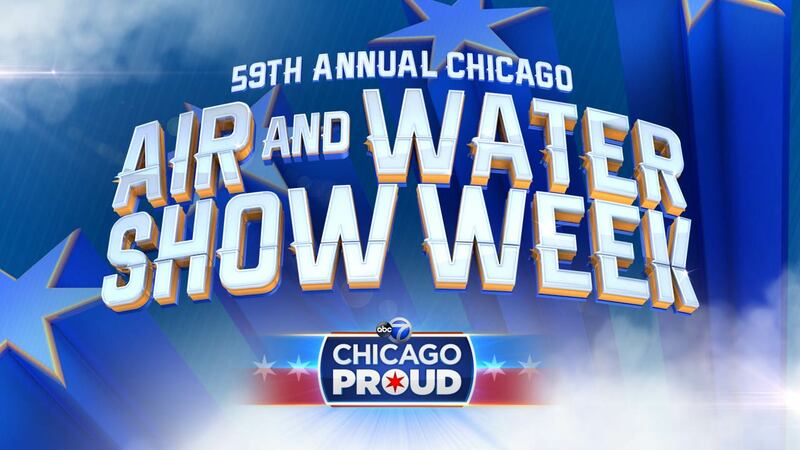 CHICAGO (WLS) -- ABC 7 PRESENTS: AIR AND WATER SHOW WEEK, featuring a sneak peek of all the heart-stopping and thrilling acts that make this a must-see event in Chicago. Beginning the week of August 13 through the 18, ABC 7 Eyewitness News will capture the many behind-the-scenes stories leading up to the spectacular show that has become one of summer's most anticipated traditions. As the excitement builds before the show, ABC 7 Eyewitness News in the morning will report live from North Avenue Beach with Anchor/Reporter Terrell Brown and Meteorologist Tracy Butler on Friday, August 18 from 4:30-7:00 am and again at 11am. The Chicago Air and Water Show runs August 19 and 20 on Chicago's lakefront. ABC 7 Eyewitness News will spotlight anchor and daredevil-in-waiting, Ravi Baichwal, who will fly high above Chicago at blazing speeds with the world famous U.S. Navy Blue Angels. Other special segments will showcase everything from the courageous pilots behind AeroShell Aerobatic Team who have more than 100 years combined experience, to a man who traded life behind a computer for a job soaring through the clouds. ABC 7 Eyewitness News goes inside one of the WWII fighter planes and discovers just what it takes to become a member of the U.S. Army Parachute Team Golden Knights - who manage perfect landings even when jumping out of aircraft at 12,500 feet above the earth's surface! Viewers will also get insider tips for the best parking, viewing spots and restaurants to help them enjoy the amazing Chicago Air and Water Show weekend with the family.